Our Lighthouse soap mold features remarkable detail, including birds, wind-blown grass, and the mighty ocean beyond. This costal classic is perfect for beach houses. Avg. 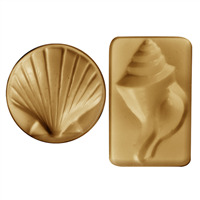 Bar Weight: 5.25 oz Bar Depth: 1.25"
COMMENTS: This is a really pretty scene for customers who love anything beach related. The soaps are gorgeous!